The heat of summer is upon us and what better way to cool down than with a bowl of iced noodles. 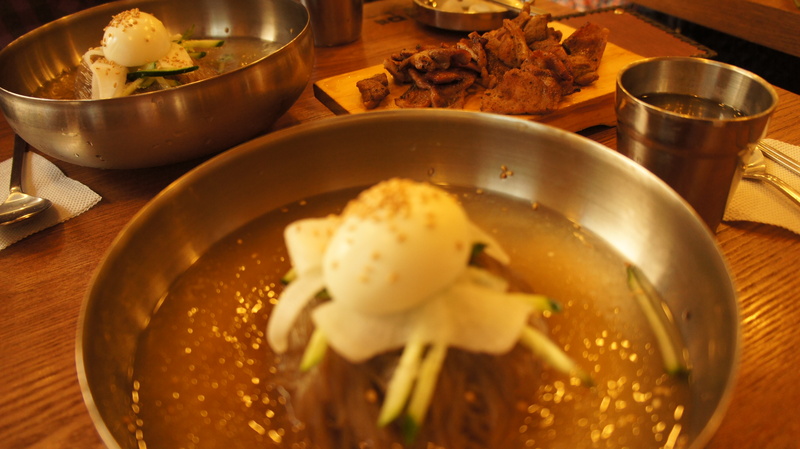 냉면 (Naeng-myun) means “cold noodles” and is a very popular dish among Koreans, particularly during the summertime. While it may be prepared differently from place to place, the basic bowl usually contains buckwheat noodles served in a special iced broth topped with cucumber strips, radish, sesame seeds and half a hard boiled egg (yes, only half). 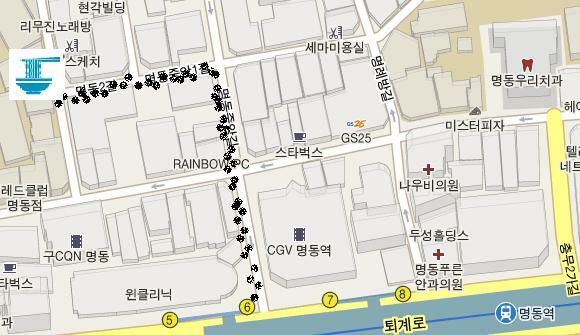 So far I have found a wonderful little place in 명동 (Myeong-dong), Korea’s trendy shopping district. I happened to stumble upon it with my boyfriend on an unexpectedly hot day. 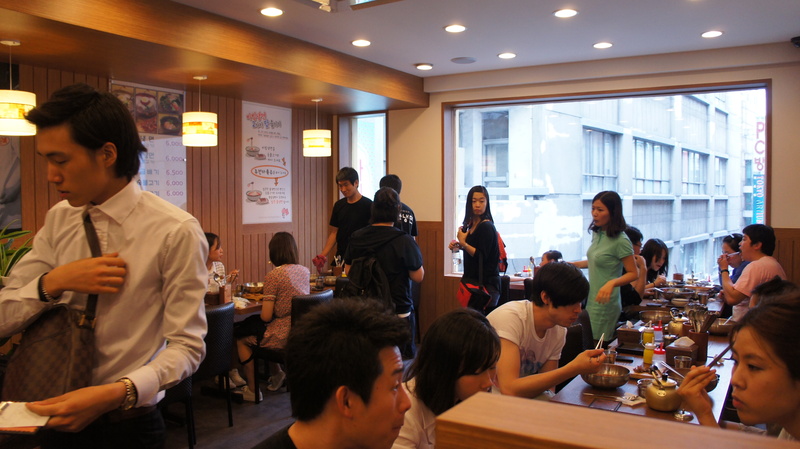 육쌈냉면(Yook-Ssam Naeng-myun), as it is called, is actually a chain and can be found in other locations. This particular location, however, was a very small and narrow two floor establishment. It was clean and simple with your basic Korean style wooden furniture. With such a small place, it wasn’t surprising that we had to wait a few minutes for an available table. Luckily, when we were finally seated, we got a table by the window overlooking the busy strip below. The restaurant its self specialized in 냉면(Naeng-myun), and is actually quite famous for it, so they had a very short menu on the wall mostly built around this type of dish. My boyfriend and I both ordered the house special, 물냉면. To our delight, it turned out that every order was served with a slab of freshly prepared 불고기 (bulgogi), which is Korean style marinated barbecue beef. Everything was absolutely delicious! The 물냉면(Mul-naeng-myun; basic cold noodles) was perfect and the broth was so flavorful. Needless to say that the 불고기(bulgogi; Korean styled beef) was just as satisfying, not to mention incredibly tender. 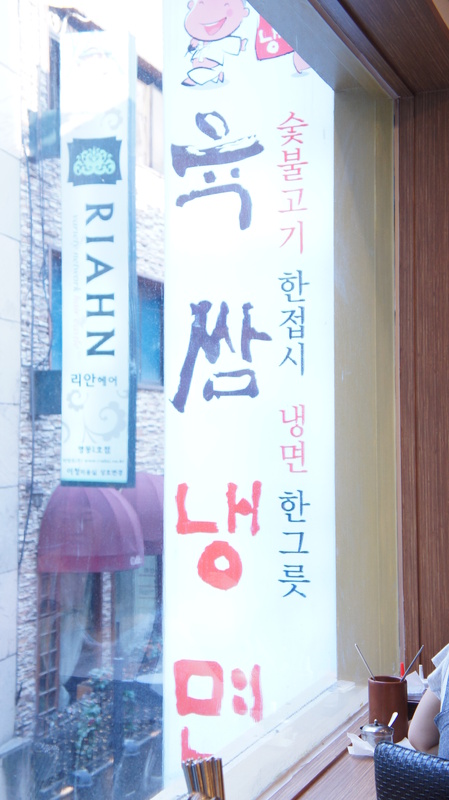 It was the perfect lunch for a hot day and all for the low price of about 6,000₩ per person. Cheap and satisfying, is there really anything more you could ask for? So, next time you’re in the area be sure to drop by and cool off with a tasty bowl of cool noodles. On a side note, when we left the restaurant the line went down the stairs and out the door onto the main street. It is a very popular spot, especially in the summer, so be sure to have time to spare. Believe me, it will be worth the wait! Until next time, happy eating! From the #6 Exit out of 명동역(Myeong-dong Station) and take the second left. At the end of the street in a narrow stairway leading up to the restaurant. If you see the Forever 21, you've gone too far. 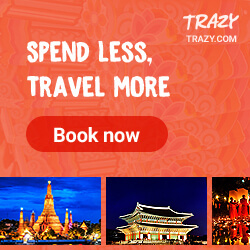 Tags: Best mul naengmyeon restaurants, Best restaurants in Seoul, Korea, Mul naengmyeon in Myeong-dong, Mul naengmyeon restaurants in Korea, Restaurants in Myeong-dong, Seoul, South Korea, Traditional Korean dishes. Bookmark the permalink. Previous post ← Nobody better lay a finger on my Butterfinger!